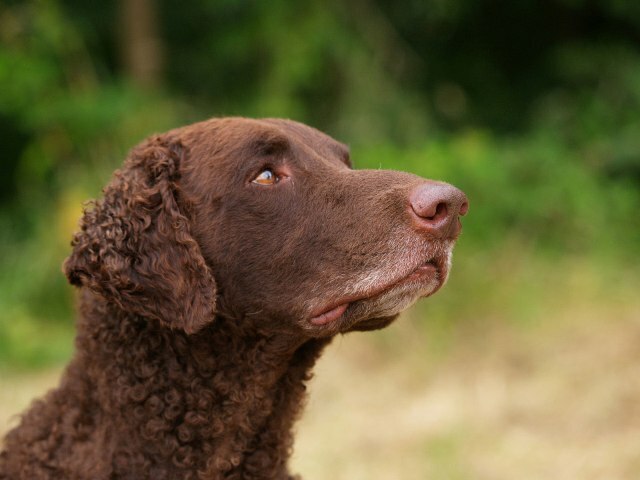 Created to retrieve game from land or water, the Curly-Coated Retriever dog breed was popular with English gamekeepers, hunters, and poachers alike. Today he competes in such dog sports as field trials, agility, obedience, and flyball and has been successful as a therapy dog, drug detection dog, and search and rescue dog. When he’s not out working or competing, he’s happy to lie beside his favorite person, enjoying a nice back scratch. The Curly-Coated Retriever has been around since the late 18th century, probably created by crossing now-extinct Old English Water Dogs, Irish Water Spaniels and small Newfoundlands, with, yes, some Poodle added later. The result was a black or liver-colored retriever with tight curls on his body and a zest for water retrieving. The Curly-Coat is a fun and interesting dog, no doubt about it. The Curly may be uncommon, but he has a dedicated band of followers who prize him for his intelligence, trainability, multiple abilities, sense of humor and, of course, that unusual appearance. He’s not the breed for everyone, but if you can appreciate his constantly thinking brain, you will find him to be a loving, talented and entertaining companion. A typical retriever, he enjoys activity, although he requires somewhat less exercise than, say, a Lab or a Flat Coat. Channel his energy into dog sports such as agility, flyball and flying disc games, or teach him to pull you or your kid on skates or a skateboard. He’ll also do well in competitive obedience. The Curly is slow to mature, however, so it can take time for training to stick. Be patient, and use positive reinforcement techniques such as play, praise and food rewards. When the motivation is there, the Curly learns quickly and easily. The Curly-Coated Retriever has the most unusual coat of all of the retriever breeds. The coat requires only moderate grooming, and the breed sheds only twice a year. Curly-Coated Retrievers generally have an oily coat, which is more likely to cause reactions in people with allergies. Curly-Coated Retrievers are more reserved around strangers than other retriever breeds and needs to be properly socialized to avoid any timidity. Curly-Coated Retrievers are sporting dogs and have the energy that other sporting and working dogs have. If they are not given adequate exercise, at least 30 to 60 minutes per day, they can become quite destructive in their boredom. Curly-Coated Retrievers tend to be mouthy and will nip and chew everything in reach, including toys, clothes, and hands. The Curly-Coated Retriever is intelligent and enjoys working, but he needs a strong, confident owner who will keep him from taking charge. He also needs variety in training and activities because he tends to get bored doing the same old thing again and again. 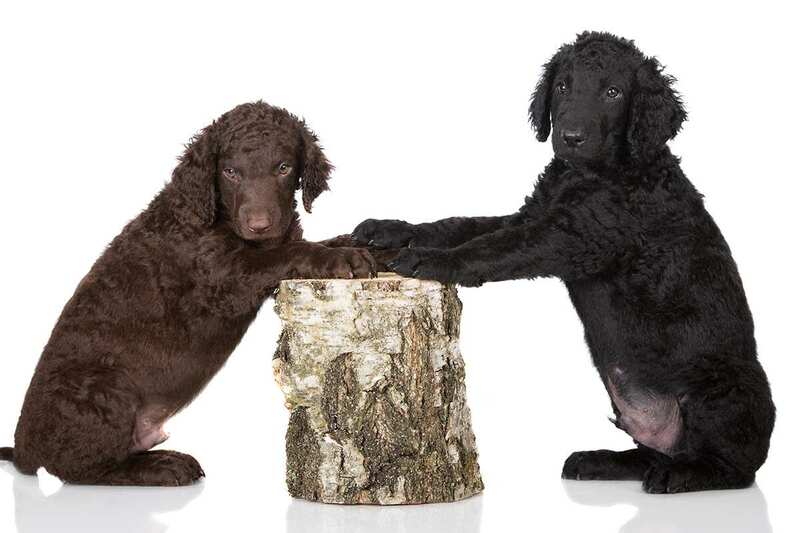 Curly-Coated Retrievers are more difficult to find than other breeds, but it is still important to look for the best possible breeder, even if long waiting lists await you. Curly-Coated Retrievers take longer to mature than other breeds, so be prepared for your dog to act puppylike for at least three years. In general, Curly-Coated Retrievers do well with children but small children should never be left unsupervised with any dog regardless of breed. Curly-Coated Retrievers are not meant for apartments and do better in homes with a large yard where they can expend their energy. They are quieter in homes when their energy levels are met. Although they enjoy the great outdoors, Curly-Coated Retrievers are not dogs who can be kenneled outside. They enjoy being with their family and can become very destructive when left away from them. The Curly dates to the 18th century and is acknowledged as the oldest of the retrieving breeds. The Curly’s coat is unusual but easy to care for and sheds little. It can be black or liver-colored. Like most retrievers, the Curly loves playing in water. A home with a yard is the best environment for a Curly, but a person who is committed to walking him or taking him to a dog park daily can keep one happy in a home without a yard. Curlies excel at many activities, including hunt tests, agility, herding instinct tests, lure coursing, dock diving, flyball, scent hurdle racing, tracking and rally. At least one has run as part of a sled-dog team. A daily walk of up to a mile will satisfy a Curly, but he’ll take all the exercise you can give him. The exact history of the Curly-Coated Retriever is not known. 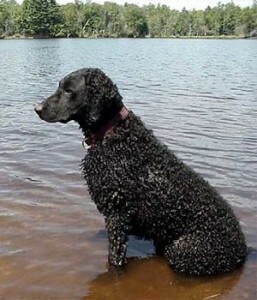 Popular conjecture suggests that the Curly-Coated Retriever descends from the now-extinct Old English Water Spaniel and from the Retrieving Setter. Other contributors to the breed are thought to include the small St. John’s Newfoundland, the Poodle, the Labrador Retriever, the Pointer and/or the Irish Water Spaniel. 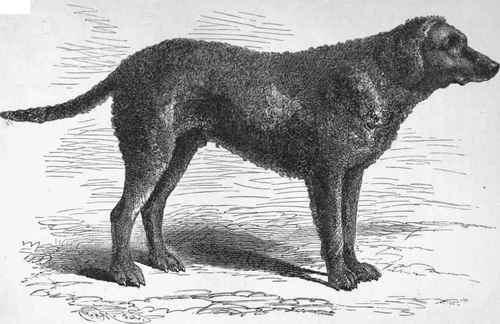 This popular gun dog was first exhibited in 1860 at Birmingham. In 1889, some Curly’s were exported to New Zealand, where they have since been used for retrieving duck and quail. In Australia, Curly-Coated Retrievers are also highly prized for use on water fowl in the swamps and lagoons of the Murray River. They are excellent all-around hunting dogs, with an especially tender mouth and unparalleled water skills. The first breed club was established in England in 1896. The breed was introduced to America as early as 1907, with the first American Kennel Club registration of a Curly-Coated Retriever being made in 1924. They are members of the AKC’s Sporting Group. 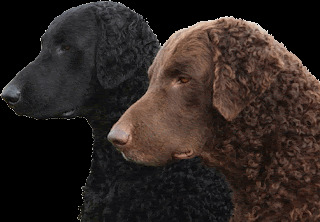 The Curly-Coated Retriever Club of America was formed in 1979 and is the breed parent club in this country. In the early part of the twentieth century, the Curly’s popularity waned while the Flat-Coated Retriever’s popularity rose. Today, the Curly-Coated Retriever retains its world-wide presence as a determined, durable hunter and a gentle family companion, although the breed is still uncommon. The Curly-Coat is full of retriever drive and determination. He'll work 'til the job is done. In the field or at home, he's alert and self-confident. He has an even temper but is more reserved with strangers than other retrievers. Early socialization — exposure to many different people, sights, sounds and experiences — helps prevent timidity. That said, don't confuse his independence and poise with shyness or a lack of willingness to please. Curly-Coated Retrievers take longer to mature than other breeds, so be prepared to live with a full-grown puppy for several years. Curlies have a mind of their own and need a confident owner who won't allow them to run the show. 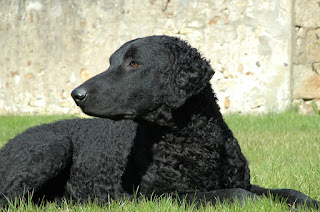 The Curly-Coated Retriever responds well to training, although not always as quickly as other dogs. That doesn't mean he's dumb. He simply gets bored easily. Keep him interested with a variety of training exercises. It's not unusual for a Curly to ignore his trainer when an exercise or activity becomes repetitive. The average life expectancy of the Curly-Coated Retriever is between 10 and 12 years. Breed health concerns may include gastric dilatation and volvulus (bloat), canine follicular dysplasia, entropion, ectropion, distichiasis, cataracts, epilepsy, generalized progressive retinal atrophy, glycogen storage disease and hip dysplasia. The Curly-Coated Retriever does not require too much maintenance. However, certain things have to be taken care of. The curls require a bit of trimming, and occasional brushing. However, this is not required at the time of shedding. A daily exercise regimen, including retrieving and swimming, is important for Curly-Coated Retrievers. And if you are in search of an outside pet, the Curly-Coated Retriever is adaptable to living outdoors in temperate climates. Curly-Coated Retrievers grow to become large dogs so it is essential that you start training when they are puppies. It is also important that you keep in mind that because they are such great Retrievers, they tend to mouthy and chew things up as pups. This unwanted behavior must be nipped in the bud at an early age. The Curly is highly trainable and responds well to repetitive training sessions along with positive reinforcement. His willingness to please makes the Curly-Coated Retriever the perfect candidate for AKC Sanctioned Obedience Trials. Owners who plan to use their Curly-Coated Retrievers for hunting purposes should acclimate the pup to water as soon as possible. This doesn’t mean that a ten week old puppy should go into icy water in the freezing cold. It’s best to buy a plastic wading pool and fill it with water on a mild day. More than likely, the pup will find his way in and have a grand, old time. A retrieving dummy will make his first experience in the water a good one. Like other retriever breeds, the Curly Coated version needs lots of vigorous exercise every single day. They are an active person's dog – couch potatoes should steer clear of this breed. They love running, swimming, hiking, playing ball and catching frisbees. They can be competitive in agility courses, but they are not as obedient as their Golden Retriever counterparts, so they often do not excel in this arena, but they enjoy the activity and eat up the attention. Curlies need as much mental stimulation as they do physical stimulation and should always be provided with plenty of interesting activities throughout the day, especially when left alone. Inactivity and boredom leads to destructiveness and hyperactivity that is hard to curb. The Curly coat of small, tight, crisp curls has little odor and is easy to care for. Comb or brush it out before bathing with an undercoat rake or a slicker brush and comb. Don’t worry that brushing will take the curl out of the coat. Depending on how dirty a Curly gets, a bath is necessary only every month or two. Most Curly coats dry quickly, sometimes in as little as ten minutes. Don’t blow dry a Curly unless you want him to look like a chia pet. The only other grooming is a little trimming to neaten any straggly hairs, a bushy tail, or excessive feathering on the backs of the legs and behind the ears. Some Curlies have tufts of fur between their toes, giving the feet the appearance of fluffy houseslippers. These tufts are usually trimmed for the show ring, but can be left alone if you like the look. Curlies don’t shed much, but they do shed. If your Curly spends time in the house, you will find hair on the furniture or floor. The coat usually sheds a small amount year-round, with a heavier shed twice a year. The rest is basic care. Trim the nails as needed, usually every few weeks. Keep the ears clean and dry to prevent ear infections. Brush the teeth frequently for good overall health and fresh breath. 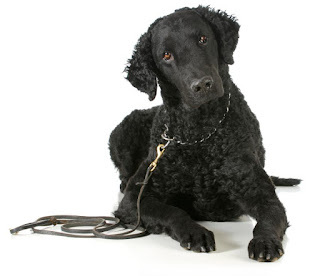 The Curly-Coated Retriever is a great companion for older children who can stand up to his size and energy level, but he may be overwhelming for younger children who are easily knocked down in play. Any time your Curly interacts with children, lay down some ground rules for dog and child. No ear pulling, tail pulling or biting allowed! For the safety of both, never leave small children unsupervised with any dog. Curly-Coated Retrievers generally do very well with other dogs and animals but socialization is still important in regard to animal interactions. 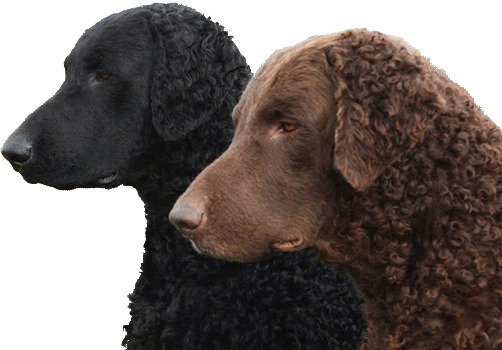 Is the Curly-Coated Retriever the Right Breed for you? 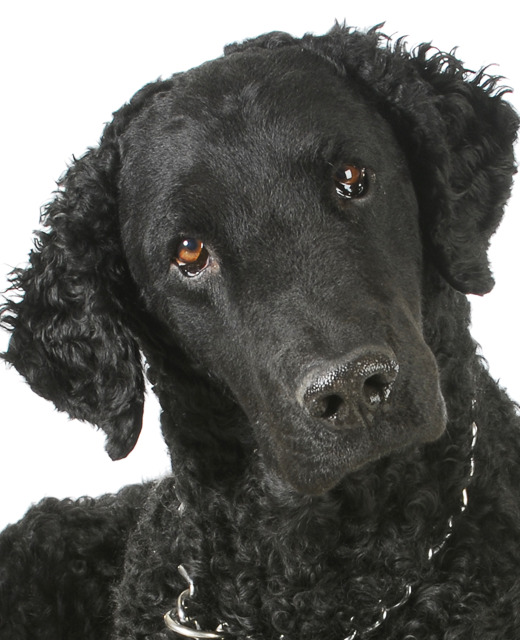 Moderately Easy Training: The Curly-Coated Retriever is average when it comes to training. Results will come gradually. 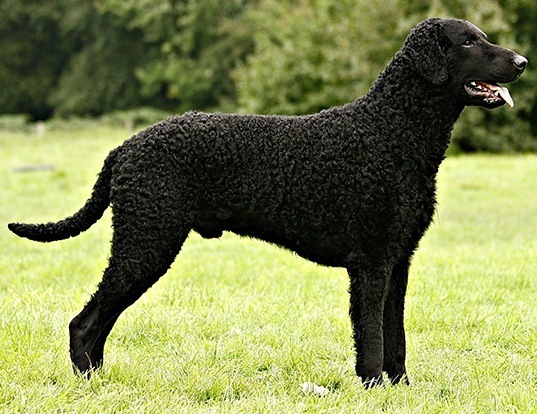 You might mistake the Curly-Coated Retriever for a Labradoodle, but he’s a distinct breed, created in the 18th century by crossing now-extinct Old English Water Dogs, Irish Water Spaniels and small Newfoundlands. And yes, there’s some Poodle in the mix, too.